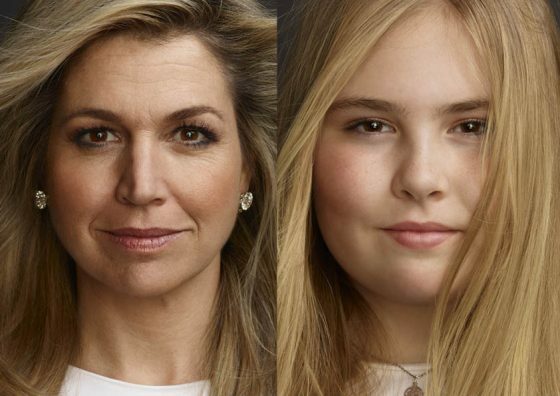 The Dutch state information service RVD has published a new series of portraits of queen Maxima and her three daughters by Dutch photographer Erwin Olaf. The portraits were taken on April 18 this year, to mark king Willem-Alexander’s 50th birthday. It is not the first time Olaf, who is one of the Netherlands most acclaimed contemporary photographers and famous for his highly theatrical compositions, has taken pictures of the Dutch royal family. In 2013 he produced the portrait of the king for the new two euro coin and also photographed Maxima for a formal portrait in 2011. Meanwhile, broadcaster NOS reports that the official portraits of the king are not proving popular and only 55 have been sold since the three works were unveiled in 2013. It is customary for portraits of the monarch to hand in government buildings and court rooms. By contrast, the famous official portrait of queen Beatrix by Carla Rodenberg sold at least 660 times. The biggest seller is a photograph by Rineke Dijkstra, which has been ordered 26 times, NOS said. The total procedure to produce the three portraits cost €450,000, including a €75,000 payment to each artist.